In honor of his birthday, His Majesty King Willem Alexander, commissioned an official portrait from Flatland’s celebrated artist, Erwin Olaf. The royal house again demonstrates its panache and unique character by working with an artist as contemporary and exciting as Erwin Olaf. 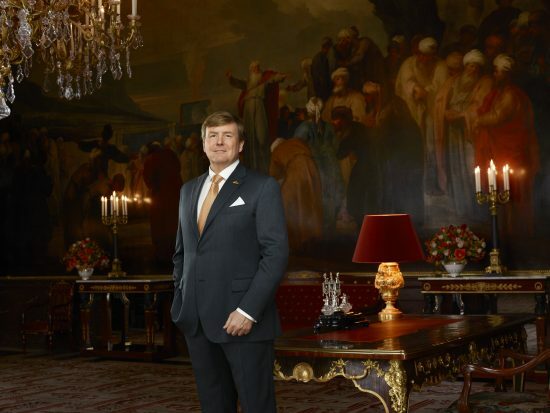 The portrait not only shows the strong and stalwart personality of Willem Alexander, but also how he feels at ease with the photographer Olaf who already has an artistic relationship with the royal family; in 2017 Olaf took moving photos of Her Majesty Queen Máxima and her three daughters, Princess Catharina-Amalia (the Princess of Orange), Princess Alexia and Princess Ariane. These photographs were related to Olaf’s ‘Paradise Portraits’, which were intimate studies of the human face.